History Viewer is an easy-to-use tool for browsing through, printing and exporting your message history. To access the module, click the View Message History button found on the toolbar of the main Softros LAN Messenger window. The History Viewer window will appear on your desktop. A list of the users you have ever contacted through Softros LAN Messenger is located on the left. Messages exchanged with a user you select on the left are displayed on the right. The following buttons are found on the toolbar of the History Viewer window. Print — opens a dialog box to print selected or all messages exchanged with a certain user. Browse Log Files — accesses the folder storing all conversation logs. 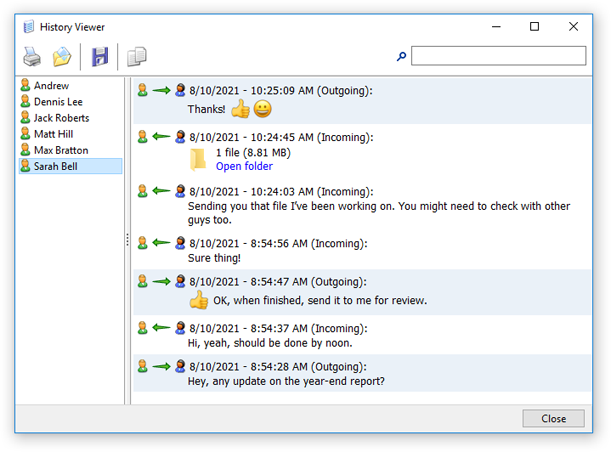 Save Messages to File — opens a dialog box to save to a text file selected or all messages exchanged with a certain user. Copy Selected to Clipboard — copies selected messages to the clipboard to further paste them into a conversation you are having or a document you are editing. Additionally, there is a search text box in the top right-hand corner of the History Viewer window. To start a search, type a search term in the text box, and then press ENTER on the keyboard. If the search returns any results, they will be highlighted in green. To jump to each next result, press ENTER. You can search only through the history of a user selected on the left.